Just over a year ago, my family relocated from Manchester-by-the-Sea, Mass., to a lakeside home and studio in southern New Jersey that is not quite as close to the seashore, but now affords me a large, airy studio on the water. Spending time at the water, whether harborside, at the beach, or on a boat, has always been important for my work. Working with a water view is ideal. I am a short drive to the ocean, rather than a quick walk, but the body of water my studio is on is a tributary and is endlessly interesting as far as light, reflection and movement. Plus I've gained a high-ceiling, light-filled, generous studio space. I couldn't ask for more. The encaustic process involves wax, pigment and heat. Encaustic is an ancient medium dating back to 800 B.C. and later used by the Egyptians for mummy tomb portraits. Some encaustic paintings have survived 2000 years. Ruth began working in encaustic in 2009 and developed her encaustic process during a 3-year intensive studio practice and study of the medium. 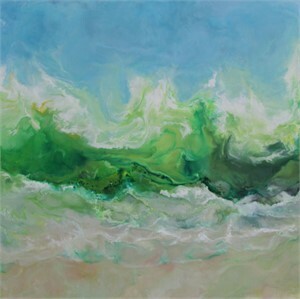 She uses the best materials available; recent innovations in these materials have allowed her to experiment to paint larger, thinner and on canvas, while still maintaining the primary properties of translucency and opulence that make encaustic such a rich medium for Ruth's sea and nature themes. Ruth's process involves heating pigment-embedded wax on a hot palette. As soon as her paint-laden brush leaves the palette, it begins to harden. Each paint mark made on canvas must be reheated to fuse to the canvas and to previous marks and layers. In a medium-sized canvas, Ruth has laid more than a hundred layers and has fused each with either a high-heat air gun or a small iron. This is a labor intensive, messy, hot, uncomfortable process that relies on Ruth's ability to "go with the flow" and manipulate the materials to her end. She works on a flat easel, standing, and uses gravity as well as brushes and palette knives to help move the paint. Traditionally, encaustic paintings are made with beeswax paints on small, hard surfaces. Ruth uses a combination of waxes and oil paint pigments, including a small amount of beeswax. Ruth mixes almost all her paints herself, stretches all her own canvases, and does the framing as well. Ruth's encaustic paintings are easily cared for by dusting with a clean, dry, cotton cloth. Just over a year ago, my family relocated from Manchester-by-the-Sea, Mass., to a lakeside home and studio in southern New Jersey that is not quite as close to the seashore, but now affords me a large, airy studio on the water. Spending time at the water, whether harborside, at the beach, or on a boat, has always been important for my work. Working with a water view is ideal. I am a short drive to the ocean, rather than a quick walk, but the body of water my studio is on is a tributary and is endlessly interesting as far as light, reflection and movement. Plus I've gained a high-ceiling, light-filled, generous studio space. I couldn't ask for more. PROCESS The encaustic process involves wax, pigment and heat. Encaustic is an ancient medium dating back to 800 B.C. and later used by the Egyptians for mummy tomb portraits. Some encaustic paintings have survived 2000 years. Ruth began working in encaustic in 2009 and developed her encaustic process during a 3-year intensive studio practice and study of the medium. 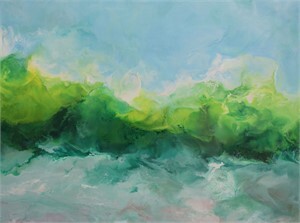 She uses the best materials available; recent innovations in these materials have allowed her to experiment to paint larger, thinner and on canvas, while still maintaining the primary properties of translucency and opulence that make encaustic such a rich medium for Ruth's sea and nature themes. Ruth's process involves heating pigment-embedded wax on a hot palette. As soon as her paint-laden brush leaves the palette, it begins to harden. Each paint mark made on canvas must be reheated to fuse to the canvas and to previous marks and layers. In a medium-sized canvas, Ruth has laid more than a hundred layers and has fused each with either a high-heat air gun or a small iron. This is a labor intensive, messy, hot, uncomfortable process that relies on Ruth's ability to "go with the flow" and manipulate the materials to her end. She works on a flat easel, standing, and uses gravity as well as brushes and palette knives to help move the paint. Traditionally, encaustic paintings are made with beeswax paints on small, hard surfaces. Ruth uses a combination of waxes and oil paint pigments, including a small amount of beeswax. Ruth mixes almost all her paints herself, stretches all her own canvases, and does the framing as well. Ruth's encaustic paintings are easily cared for by dusting with a clean, dry, cotton cloth.